It's Day 3 of my Ninja Turtles cocktails! The kids are back in school today after the nice long holiday weekend, which means it's time to clean up all of the stuff that I can't clean while they're here. Actually 3 of the kids are back in school because........our oldest.......is out of school and officially a senior! What? Who said that? I stood next to him in the bathroom mirror today......yea I'm short. The weather has been nice for the past few days here, which I love. I am SO ready to wear shorts, tank tops and flip flops every day for a while now. Today I move onto Leonardo as my turtle of the day. 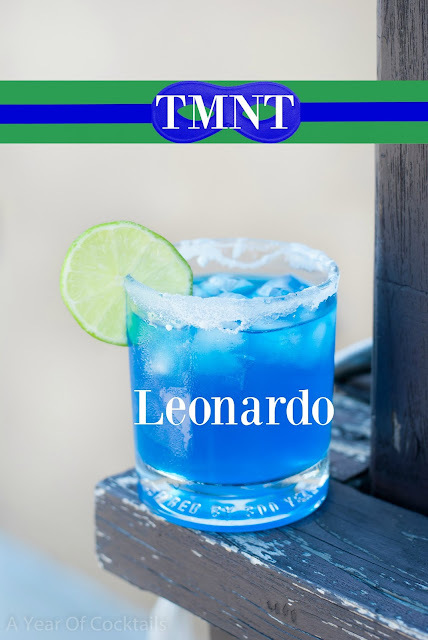 Leonardo is strong, fearless and a great leader. Thinking of those traits I thought my go to ingredient for this cocktail should be tequila. At least for me when I drink tequila I think I'm strong, fearless and a great leader! Don't forget to check out my other turtle cocktails: TMNT Raphael, TMNT Michelangelo, TMNT Donatello as well as my Ninja Turtle cocktail and Hockey Stick. Rim a cocktail glass with fine sugar and fill half way with ice.In a shaker, add ice and all of the ingredients above. Shake and strain into the glass. Here's to another day of turtles! Have I covered your favorite turtle yet?